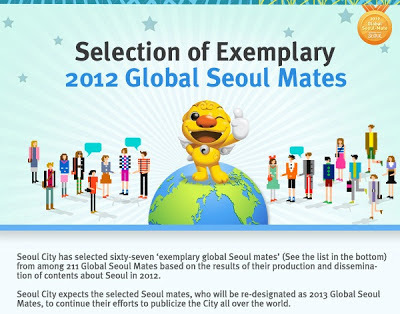 Last March 13, I received an email from the Seoul Metropolitan Government informing me that I have been chosen as one of the Exemplary Global Seoul Mates of 2012. "Seoul City has selected 67 Exemplary Global Seoul Mates from among 211 Global Seoul Mates based on the results of their production and dissemination of contents about Seoul in 2012," the email said. I became a Global Seoul Mate last year and have been enjoying my role in promoting Seoul-related contents on this blog, Twitter, Facebook and YouTube. 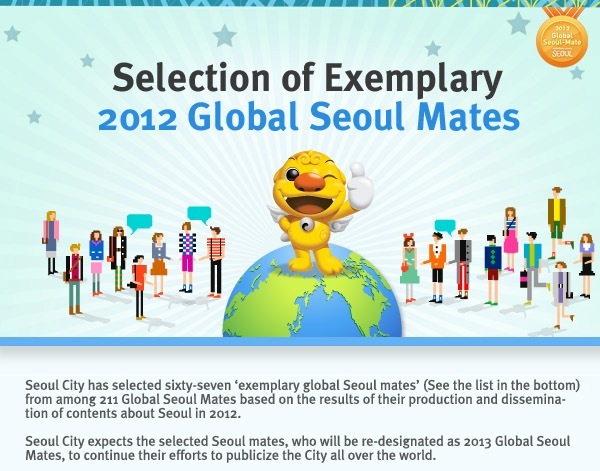 I thank Seoul City for this commendation and I'm excited to continue my role as 2013 Global Seoul Mate.